Whew! this has been a busy week. Wine Tasting was fun, thanks for coming if you were there. If not and you know where to find my front porch, come on by Wednesday evening 6:15 (because I’m always running late) -7pm. (sorry I can’t post the address). We started with two chardonnays, but this wine tasting quickly got away from me and we went through quite a few bottles from my collection (my name is Debbee and I hoard wine). We started with the 2009 Pennywise Chardonnay ($10.99 elsewhere price) and the 2011 Indigo Eyes Chardonnay ($12.99 elsewhere price). I usually like to read the back label for some clues as to what I should be tasting, but the Pennywise label was keeping that a secret! I found on-line that it received 87 points on Cellar Tracker, which is not bad. It’s produced in Napa by ‘The Other Guys’ which is part of the Don Sabastiani Family of companies. I found this wine to be light and not intense. It was a clear pale yellow and smelled mildly fruity. It tastes lightly of oak. A pleasant enough wine. 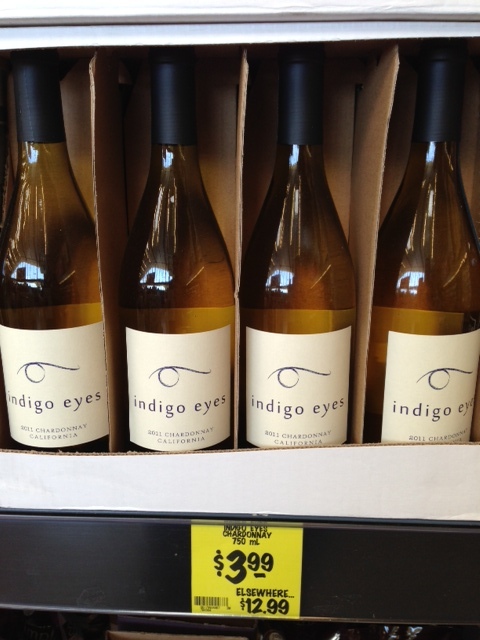 The Indigo Eyes Chardonnay was a little more yellow and tasted of tropical fruits. There was definitely more of an oaky taste. I found it to be very smooth. 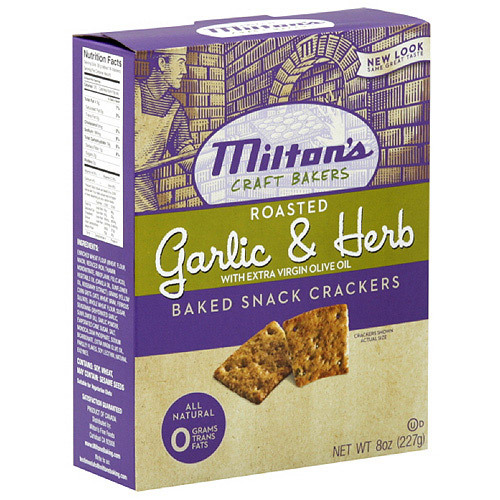 Both are pretty good for the price ($3.99). I tasted pears and peaches ~which I love~ and the strong oakyness (is that a word?) ~which I could usually do without~ but in this case, I liked it! 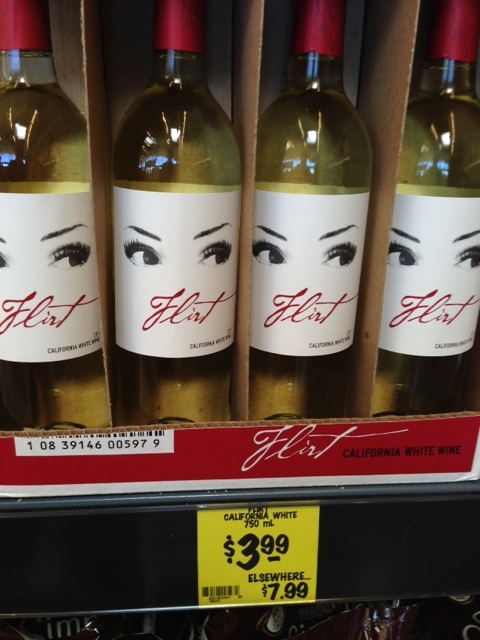 My niece, Caroline, first found this wine in the store last month. And on my way out she held it up and announced ‘Aunt Debbee, I need to try this one!’. I happened to be on my way home for tasting, so I grabbed it right out of her hand, scanned it and left. Well, nice pickin’ Caroline! 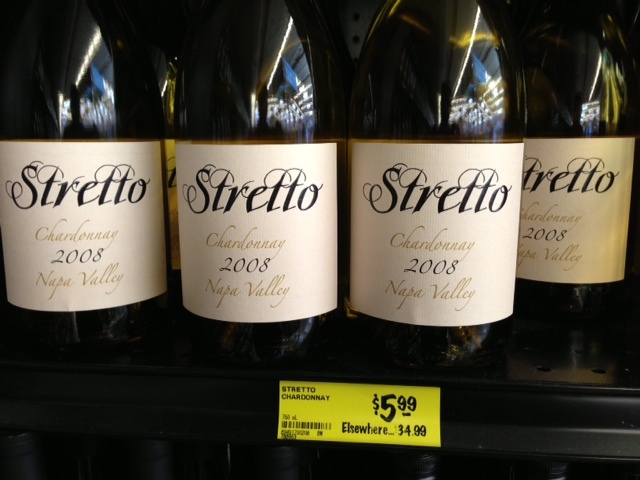 Everybody agreed that the Stretto Chardonnay ($34.99+ elsewhere price) was the best Chardonnay of the many (lol) that we tried (finished). It wasn’t even on the tasting list! It’s been selling pretty good at $5.99 a bottle and there is only about a case left at the store (they made me call from the front porch to the store to find out) So don’t be shy! Get all you want now before someone beats you to it. 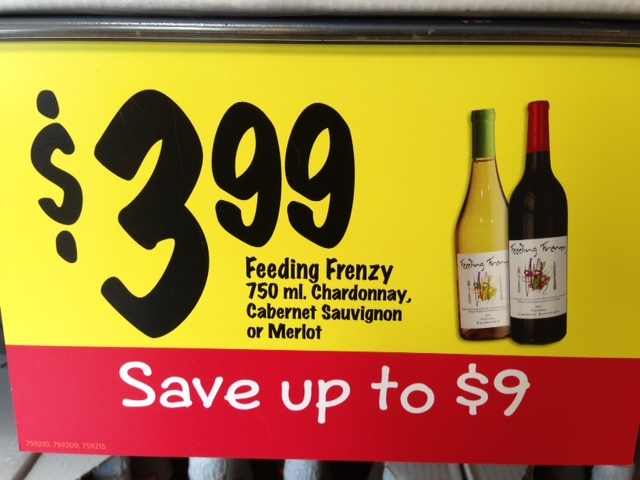 The 2011 Chardonnay and Cabernet Sauvignon from Sonoma County are an exceptional value at $3.99 this week under the Feeding Frenzy label. Not to be confused with the addictive Feeding Frenzy game by Gamehouse . Although, I could develop a mild obsession for these wines with the attractive colorful label marketed towards the ‘The Foodie’ in all of us. 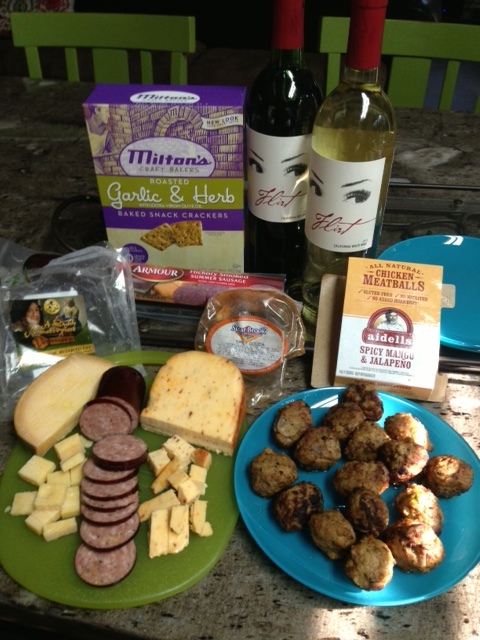 Being called a Foodie makes me feel young & hip like a single gal living in the big city. 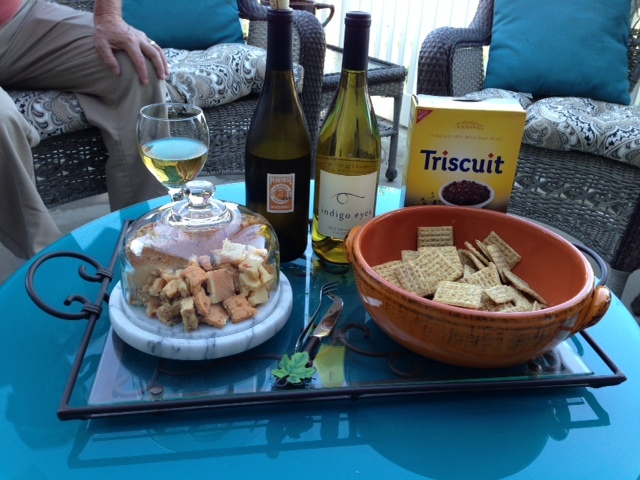 This week, my husband and a couple of friends joined me on the front porch to ‘help’ me review the Feeding Frenzy wines. Of course when people join me, we talk about all kinds of things, enjoy each others company and have some laughs. But, we still managed to take some notes on wine tasting. I Thought it smelled of red fruit like dark red cherry, but definitely no nutmeg. It tasted pretty sweet like blueberries and was light and smooth. 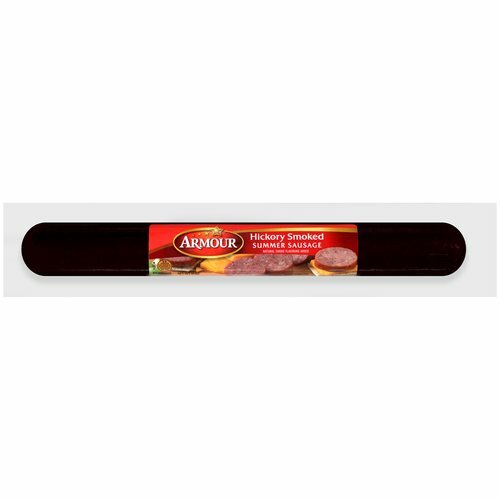 I tried this with Johnsonville Salami Deli Bites ($1.99) and Tilamook Smoked Black Pepper Sharp Cheddar Cheese($1.99). The FF Cab is very food Friendly. However, I don’t know about the pairings that they suggest on the label. Pizza with pesto & Eggplant lasagna? mmmm, no. Ribs & steaks, for sure. Regular lasagna (any Italian food really) or a nice grilled pork chop would pair nicely with this Cab. Steve tasted the wine before he read the label and thought for sure it would include the word ‘buttery’. nope. Thanks for playing Steve. Larry & Terry both preferred the Chardonnay, but took a sip of the Cab for all you faithful readers. 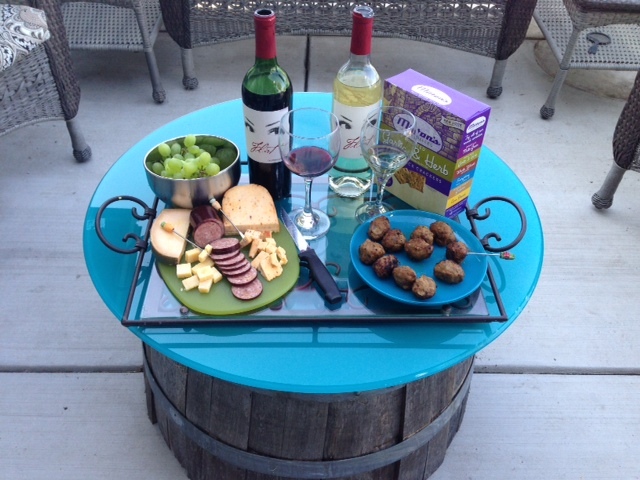 They we’re surprised that it was a sweeter Cabernet and it got a nod of approval. I managed to read some on-line reviews, but there really is very little on the internet about these wines. I found the Chardonnay was scored 85 points and the Cabernet 87. Both pretty solid according the all-knowing wine reviewers. Personally, I don’t even know what those scores mean or how they arrive at a numbered score. I’m sure there’s some detailed science behind it though. I checked out the web-site on the back of the label, even there I could not locate the Feeding Frenzy. They offer some other wines I recognized though. Black Oak, 707 Estate Wines and Zombie Zin among others. Check it out here www.chateaudiana.com . Meanwhile, I’ll see if we can get some of that Zombie Zin in the store before October. …and headed out to the porch. 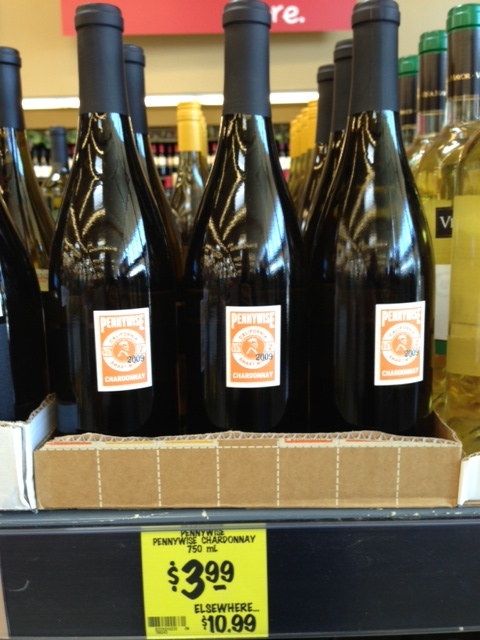 The label says, “With hints of juicy plum, vanilla, butterscotch and cherry spice, you can’t help but be tempted. So go on, don’t be shy. Take a sip.” (for a more detailed description, click here) I thought this red blend was warm and smooth. A little hint of sweetness and very drinkable. My sister wanted to put ice in hers. Of course any self-respecting wine snob would cringe at this suggestion, I told her lots of people do that with their red wine. Especially in summer time. 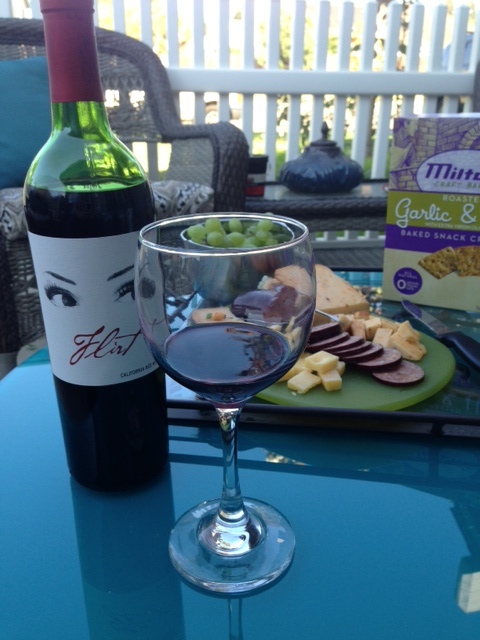 The Flirt California Red was nicely complemented by a very sharp cheese, Armour Summer Sausage ($3.99) and Milton’s Garlic & Herb crackers ($1.99). 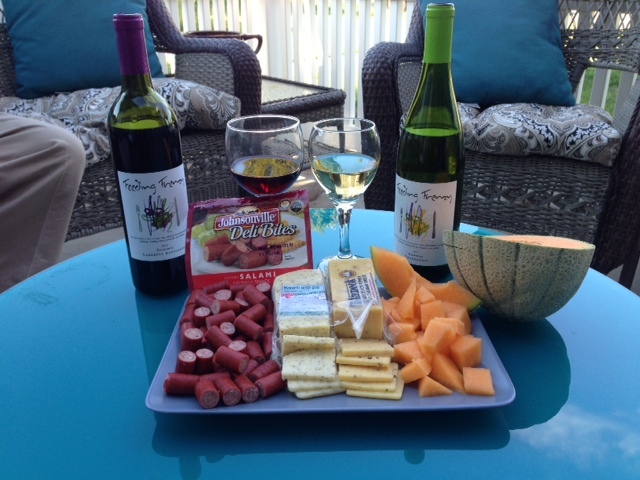 When she tasted the wine with the sharp cheese, she didn’t even need the ice. We finished about half the bottle 😉 I was pretty happy to see her enjoy the way the wine tastes different with various foods. 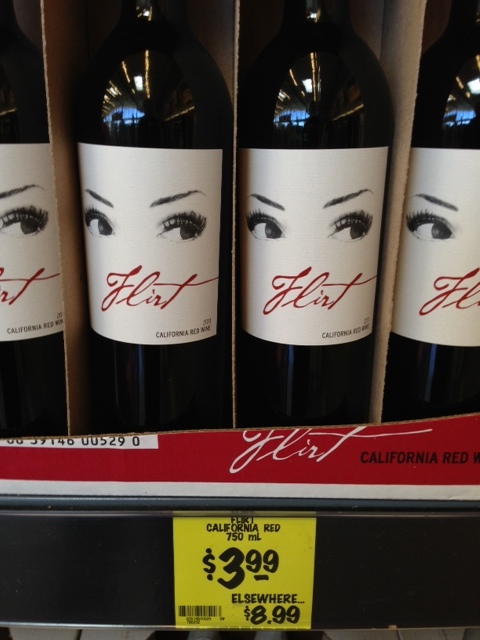 I would pair this wine with a nice grilled steak or tri-tip. The label says it’s wonderfully refreshing with a hint a of honeysuckle and fresh white peach (for a more detailed description, click here) . I thought it was refreshingly crisp. My sister said it was okay. 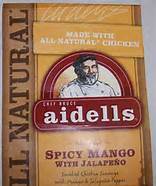 I had her try an Aidells Mango Jalapeno meatball ($3.99) then have another sip. She was hooked, we finished the bottle! 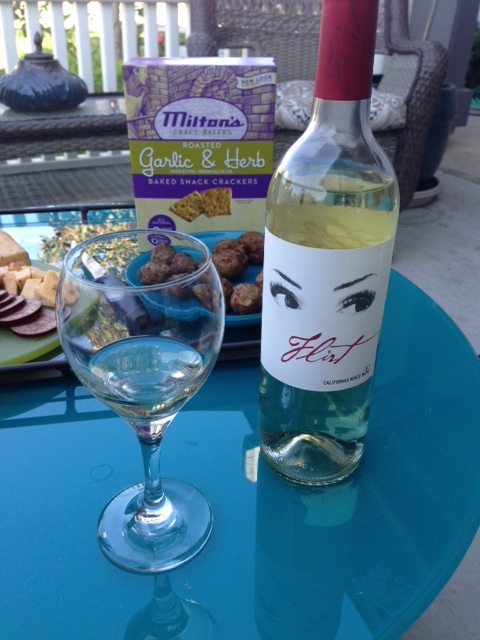 The Flirt California White is perfectly paired with spicy food. I would serve it with Mexican food or Chinese food. 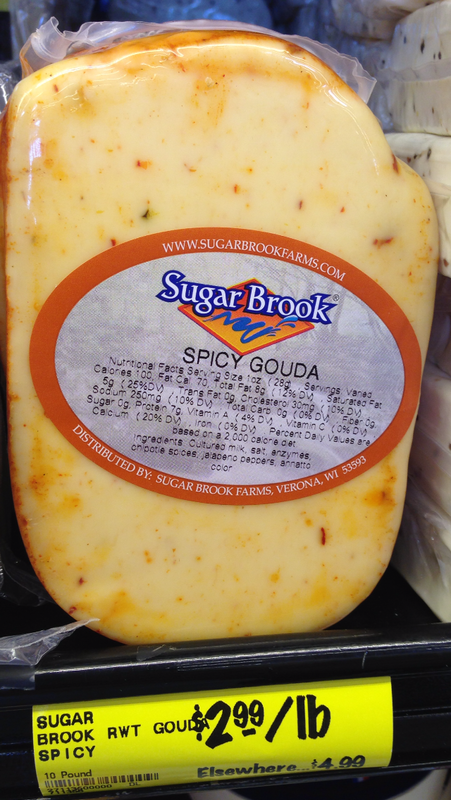 We also had Sugar Brook Spicy Gouda ($2.99) and chilled green grapes (1lb $2.99) with this wine.